Follow us on FACEBOOK to see our current work! Conversion to 57I Induction Kit. Gold colour 15” Peugeot Alloys. 3” Ashley Competition Exhaust system. Base speaker custom mounted in parcel shelf. Custom Fit Amp direct feed to bass speaker. 2 * pioneer 6*9” speakers. Later converted to a MI16 engine. Standard 1.6 GTI Shell Converted for Rally use. Re-sprayed & colour-coded in Blue. 100 Watt Main Beam Bulbs. Wiring for twin 120W spotlights. 1580cc XU Block Completely Re-Built. ‘Puma Racing’ Big Valve Head-inc Large Ports-Gas flowed, 3 Angle Valves, Head Skimmed to Match Cam. Converted to OMEX Mapable ECU- Distributor less Ignition system-Twin Coil. Custom Crank Position Sensor using 36-1 Wheel. Twin 45 Dellorto Carbs Conversion. 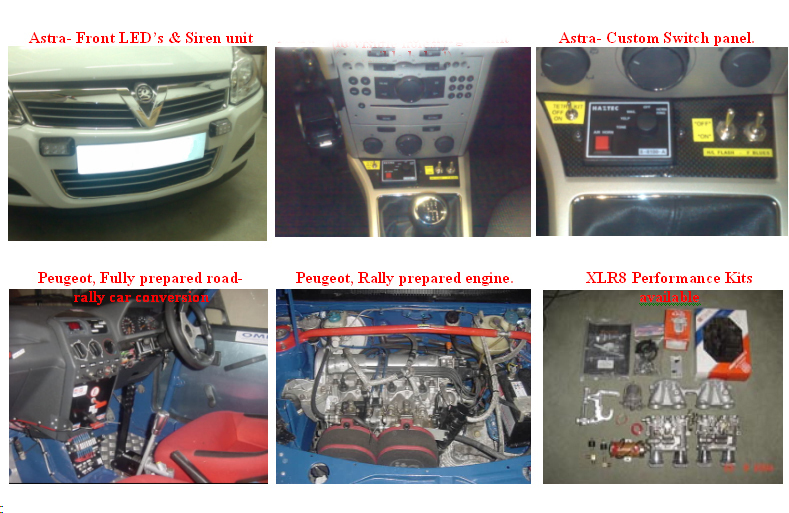 Using Facet Fuel pump, Pressure Regulator & Twin Cable Linkage. Puma racing Ported Inlet Manifold. Peugeot Sport Close ratio gearbox (Top speed 105Mph). Peugeot Sport Final Drive Crown Wheel & Pinion. Alcon solid plate 4 Paddle clutch & Pressure Spring. Quaffe ATB Limited Slip Differential. 1.9 GTI Rims In Gold. 195-45-15” Soft Compound Max Sport Intermediate Tyres. Front: AVO Coil-Overs & adjustable Dampers. Omp-Upper & lower Strut Braces. OMP 8 Point Welded in Roll cage. Hand Held Extinguisher Mounted in front of drivers seat. Sabelt 3” 5 point Harnesses. Sparco Steering wheel with 2 switches. 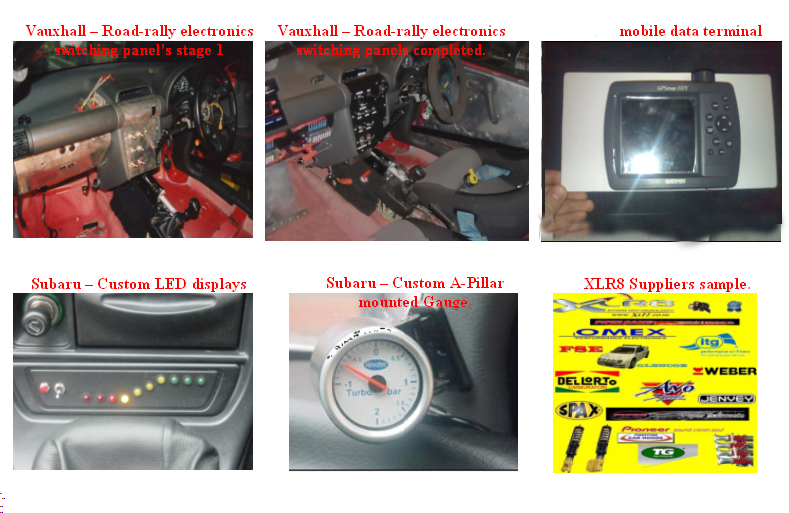 Custom Made Dash & Internal Fuse & Switch Panel. Custom Made gear linkage Gater. Alloy Heal Pads & footrest. Custom designed & Made Rev counters & Shift lights Inc Rev limiter. Custom Made Spare wheel holder. Standard GSI Shell Converted for Rally use. 10 Point Multi Cage With addition on engine bay Brace. Fast clearing front heated window. Bonnet Vents & provision for bonnet pod. Converted to run on Bike Throttle Bodys. Converted to Megasquirt Mapable ECU- Distributor less Ignition system-Twin Coil. Twin 45 Dellorto Carbs Conversion. Using Facet Fuel pump, Regulator & Twin Cable Linkage. Ashley 3” exhaust system Inc 4 branch manifold. Up graded Astra Grooved Discs. Brake pipes moved in side car. Hydraulic Handbrake mounted next to steering wheel. Quaife Close ratio ‘straight cut’ gearbox (Top speed 105Mph). Quaife Final Drive Crown Wheel & Pinion. Helix Paddle clutch & Heavy duty Pressure Plate. Tran-X 90% Limited Slip Differential. Front: FK Coil-Overs & Dampers. Rear: Converted to use strut coilovers. Safety Devices 10 Point Welded in Roll cage. Stripped out from standard & completely re-wired + Heater removed. Hand Held Extinguisher Mounted in front of passengers seat. Plumbed In extinguisher to engine bay-Mounted behind drivers seat. Racing Steering wheel Inc 2 buttons for launch control. 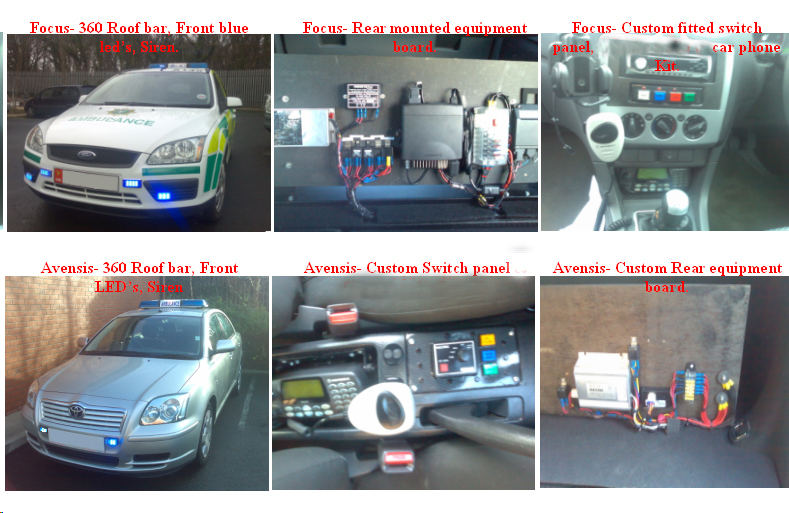 Custom Made Dash & Internal Fuse/ Switch Panel. Covert tracker installed behind BMW dash.. Turbo Timer Inc Handbrake ‘Cut-off’. Gas flowed Big Valve head. Lightend and balanced fly wheel. This car came first in class and 11th overall out of 50!. Piper X Induction kit & cold feed. Magnex Twin pipe exhaust system. Pioneer Head Unit & 6 Disc Multi Changer. Custom designed & made gear knob. Delimited Speedo cable conversion to MPH. Custom mounted ‘A’ pillar Boost gauge. ‘Custom Mounted’ Pioneer CD Head Unit + Steering remote control. Custom mounted rear 6*9 Speakers. Custom Made WRX Embroider mats & alloy heal pad. Boost Pressure set to .95 Bar. Bailey Piston Atmospheric dump Valve. Delimited-Speedo cable conversion to MPH. Momo Handbrake handle & leather Gaiter. Replaced & up rated Auxiliary drive belt. Up rated Engine ‘Earth Cables’. Pioneer CD Head Unit + Boot Mounted Multi changer. A min van that we fully stripped to the bare chassis ready for a full refurb! Full Stage 2 Conversion Comprising –RC40 exhaust system- K&N Induction Kit – Up rated Carburettor needle. New rear sub-frame & brake Pipes. New Carpet & gear Knob. New Front Seats (half leather-Special edition). Custom-Fit 6 * 9 Pioneer speakers. Custom Fitted Amplifier powering 6*9’s. 17” FOX Alloy wheels & low Profile tyres. K & N 57I Induction Kit. Custom fitted Mats with MR2 Logo. 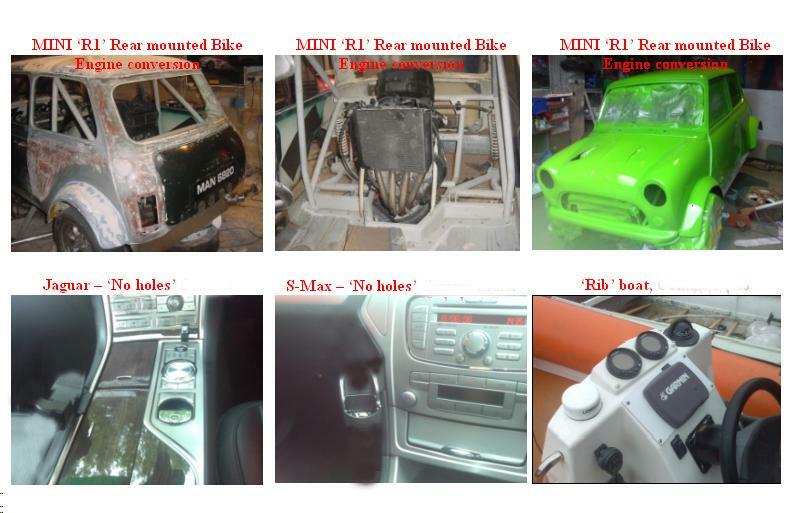 A standard mini that we fully converted & fabricated everything to convert it to a rear engined RWD R1 powered mini!..... The pics speak for themselves! Up-grade to ‘performance oil & oil filter. 2 * Phoenix Gold’ Amp Kits installed. Many future modifications planned by customer!